Hotel X-Bionic Sphere was an amazing place for this: “Discover a place where the combination of luxury, pleasant atmosphere and breath-taking energy is an absolute must. X-BIONIC® HOTEL will satisfy the needs of every visitor from athletes, professional teams, and families with children to visitors of conferences, exhibitions, and congresses. ” Website of the hotel We could experience this. DXN has been in Europe for more than 9 years. We enjoy the blessings what the DXN products and this business have brought into our life. We feel, that together we can do a miracle! The slogan of this camp was: Let the game begin! The master of Ceremony was Dr. Rajesh Savera Lifestyle Coach and Ayurveda Physician. Here you can watch the beginning of the 6. European DXN Leadership Camp with the European Flags. We could hear the message of Dr. Lim – the CEO of DXN – to the European DXN members. And we could also buy this new book: “My journey with DXN. The European Regional Coordinator, Mr. Katona spoke about “How to grow in Europe?”. Finally, we could listen 3 European DXN leaders about their DXN stories and their business strategy. The program of the 6. European DXN Leadership Camp Slovakia 2018 – Day 2. A napi DXN kávénk 193. – Our daily DXN Coffee 193. We had a great presentation from Huda Tahmaz Gold Diamond from Jordan. She spoke about her success story and the keys of success. Then HC Teoh, Chief Marketing Officer spoke about the new DXN products and cosmetics. A napi DXN kávénk 189. – Our daily DXN Coffee 189. A napi DXN kávénk 195. – Our daily DXN Coffee 195. In the evening we made group photos in the sunset at the big metal horse, and we had a great gala dinner full of with surprises. And imagine who wins in the competition? Of course our group! A napi DXN kávénk 196. – Our daily DXN Coffee 196. The program of the 6. European DXN Leadership Camp Slovakia 2018 – Day 3. Edilia Garcia the first Latin American Woman DXN Crown Ambassador shared her journey to the TOP with pleasure. I really loved her presentation and I am so happy that there were more woman speakers at this event. 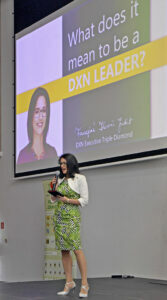 Then I had a speech, and I spoke about: What does it mean to be a DXN leader? Everyone wants to become a successful DXN leader, because of the advantages. Thanks to DXN we can take part in wonderful trips every year. We have time and money, for those people and activity that are really important for us, so we can live a truly free life. Is this true? Yes, most of it. It’s a part of it, but this is not the whole picture. Leadership has to be undertaken as a conscious decision. Only because you have downlines, you won’t be a leader. You need to improve continuously in many areas. It’s very important to improve professional skills, such as in network marketing skills, communication, and online marketing. But the only way for you to become a successful leader is to become a better person and to take care of your self-development, as much as your leadership skills. A napi DXN kávénk 190. – Our daily DXN Coffee 190. We had an amazing great time together. Thank you so much for all the organizers, participants, and everybody, who take part in this. Meet you at the next camp!